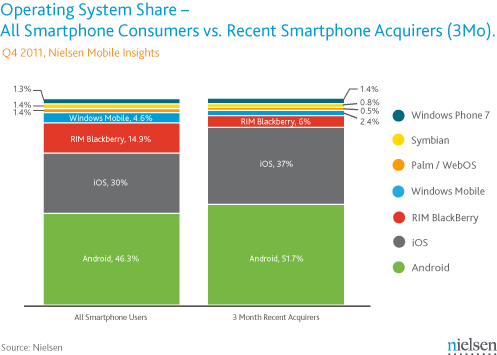 In the month of December, 91.4% of new smartphone acquirers purchased either an Android device or an iPhone. That number is up almost 5% from the previous two months, meaning RIM and Windows Phone continue to do nothing to entice consumers. The other important note that you are seeing blasted across every Apple site today, is the fact that Apple seems to have made massive jumps in a couple of categories. Most notably is the graph above that shows recent acquirers. 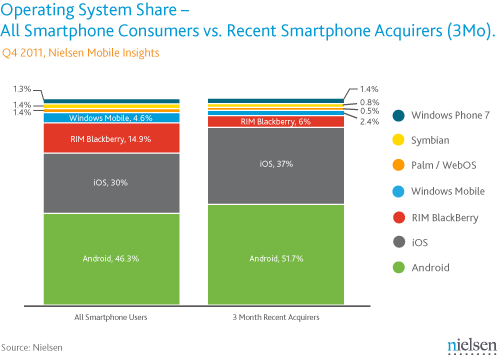 What I will say to that is, it’s not like Android phones are being purchased at a reduced rate even though many would jump to that conclusion by looking at this chart. According to Andy Rubin, daily activations are still increasing each and every day. All that this means is that the iPhone 4S came out and a whole bunch of people that were waiting for it, bought it. Does it mean that Android is dying or in decline? Not for a second. In fact, if you look at their numbers for “All Smartphone Users,” Android jumped up another 3.3% from a similar report in September, while iOS’s share only gained 2%. So again, it’s a 2-horse race – has been for a while. If you are still doing the Apple vs. Android battle and getting angered by it or insulting someone from the other OS personally, you need therapy. Android is not iOS. iOS is not Android. They will never be the same (which is a good thing) and not one of you is right or wrong in choosing one or the other. Choices are good, folks. No need to hate. 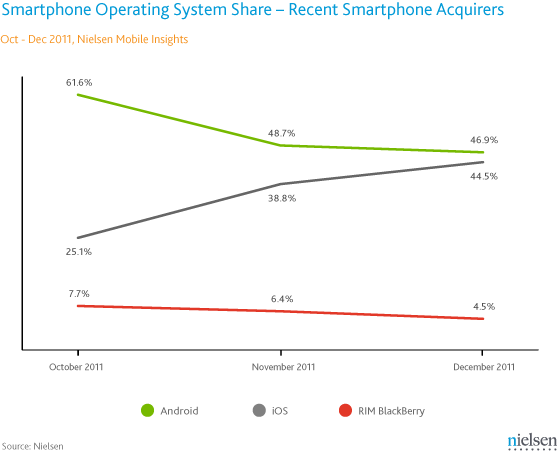 Oracle: "Daily Android Activations Likely Generate $10 Million in Annual Mobile Advertising Revenue for Google"